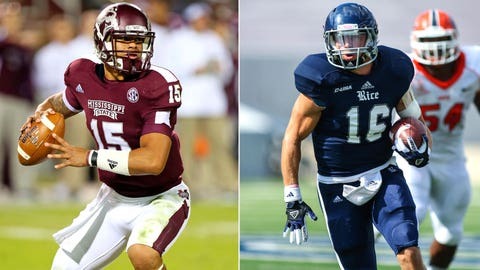 Mississippi State's Dak Prescott (2,408 total yards, 18 TDs) and Rice QB Taylor McHargue (2,722 total yards, 22 TDs) headline a Liberty Bowl clash of proficient, sneaky-good offenses. Rice (10-3, 7-1 in Conference USA) ranked No. 16 nationally in rushing yards for the season, at 240 per outing. Mississippi State, in turn, posted only middling rankings, SEC-wise, for scoring defense (8th) and rushing defense (7th) — something that creeps a little doubt into MSU’s seven-point betting line as a favorite. The best matchup? Rice tailback Charles Ross (1,252 rushing yards, 15 total TDs) needs to be his typically stellar self against Mississippi State. QB Taylor McHargue, Rice. The Owls actually claimed victory in the six games in which McHargue (2,261 yards passing, 22 total TDs) completed 10 or fewer passes. What’s more, the Rice quarterback attempted 23 or more passes seven times. So, how can McHargue qualify as a "player to watch" if his team has a better shot at winning when he’s used less — especially with only five rushing touchdowns? 1. Rice and Mississippi State (6-6, 3-5 in SEC) played Texas A&M this season, with the former losing by 21 and the latter falling by 10. In both cases, the Owls and Bulldogs surrendered 50-plus points to Johnny Manziel’s Aggies. 2. Mississippi State boasts the nation’s most impressive listing of seasonal losses — Oklahoma State, Auburn, LSU, South Carolina, Texas A&M and Alabama. 3. Sophomore quarterback Dak Prescott (above) led the Bulldogs in both passing (1,657 yards, 18 total TDs) and rushing yards (751), something no one could have predicted back in August. 4. MSU tailback LaDarius Perkins fell short of expectations, collecting only four touchdowns (two rushing) and three outings of 100-plus total yards. Of their six losses, the Bulldogs were 3-3 when factoring in the turnover battle; and of those defeats, MSU typically succumbed to the strengths of that particular foe — with the notable exception of Auburn, which rushed for only 120 yards in its last-minute comeback victory on Sept. 14. That aside, Mississippi State has earned its reputation as a stout defense, limiting 10 of 12 foes to 26 points or less for the season.